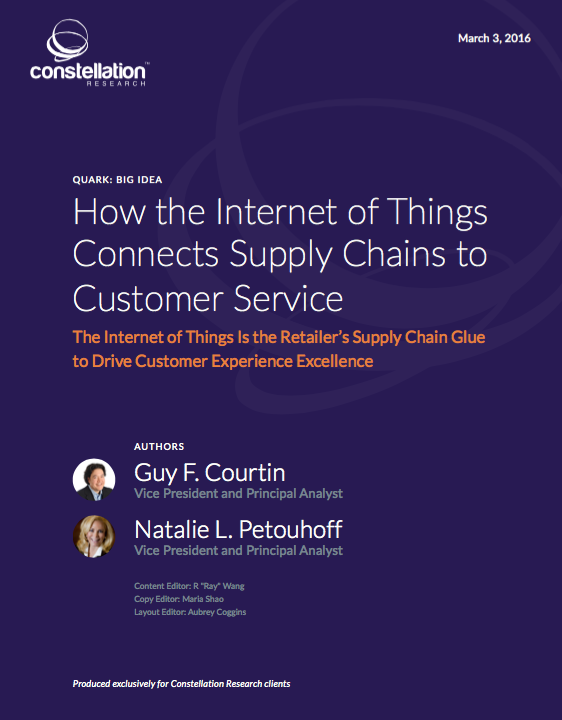 The Internet of Things Improves Customer Experience in Retail Supply Chain | Constellation Research Inc. Many retailers struggle to ensure their supply chains and customer-facing endeavors align harmoniously. Ensuring the availability of a product or service when, where and how customers want is a task with which retailers struggle, and when not executed properly diminishes the customer experience. Beyond this basic availability and delivery requirement, contributors to customer satisfaction include post-sales service, warranty redemption, availability of ancillary products, and mature customer listening and response. Customer experience produces many demand signals for retailers, but supply chains often fail to receive those signals, resulting in a failure to keep pace with increasing volume and variability of customer demands. This failure manifests in many ways: misplaced inventories, over-promised deliverables, inability to process returns, etc. Inefficiencies in the transmission of data between customer experience and the stages of the supply chain result in poor performance throughout the supply chain that result in negative retail experiences. The good news: The Internet of Things (IoT) provides the devices and infrastructure to improve the transmission of data throughout the retail buy cycle starting from the retail experience and extending throughout the retail supply chain. By employing IoT, organizations can solve many of these customer experience issues caused by inefficient data collection and analysis. CxOs can dramatically improve customer experiences by using IoT to connect supply chains to customer service.